Curious about what is in the Art in Public Places Collection of the State Foundation on Culture and the Arts? You can view the collection online! The Art in Public Places Online Catalog is updated periodically to reflect changes in the collection. Works of art in the Art in Public Places Collection are displayed in public spaces including state government offices, state libraries, state public schools, and the Hawai‘i State Art Museum. For the current locations of specific works of art, please contact the Ozzie Kotani, Registrar, at 586-9956 or ozzie.kotani@hawaii.gov. 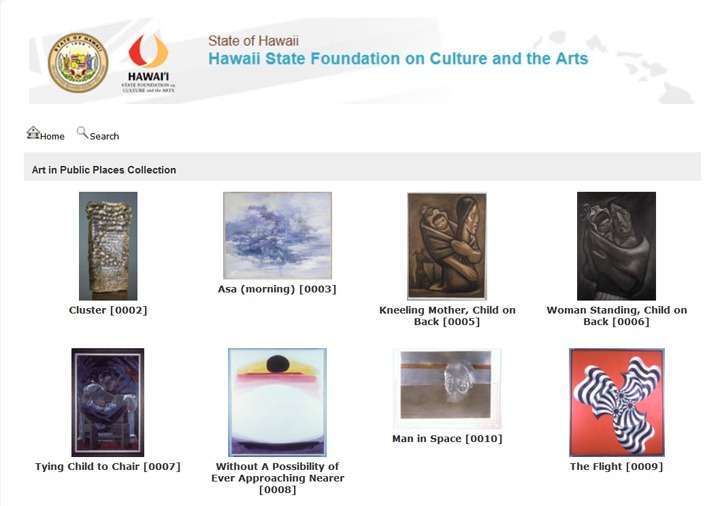 Artwork displayed in student art exhibits (such as the Hawai‘i Regional Scholastic Art Awards and Young Artists of Hawai‘i) are not included in the collection or the online catalog. Anyone wishing to use any files or images contained on this website for publication, commercial use, or any other purpose must request and receive prior written permission. Permission for such use is granted on a case-by-case basis. For information concerning permissions or photography of works in the Foundation’s Art in Public Places Collection, please e-mail Registrar Ozzie Kotani at ozzie.kotani@hawaii.gov. All requests for permission to reproduce images must be made using the Photographic Materials Request Form. Three gratis copies of the publication in which the image was used must be submitted 30 days after publication to either the Collections Manager or Registrar above. The State Foundation on Culture and the Arts retains all rights to data, images, text, and any other information contained on this website. The artwork herein are copyrighted by either the artists themselves or by the State Foundation on Culture and the Arts. All text and image files on this website are made available to the public for archival, documentary, noncommercial, educational, and personal use only. Any unauthorized commercial use or publication of any materials on this website without prior written consent from the Foundation is strictly prohibited.